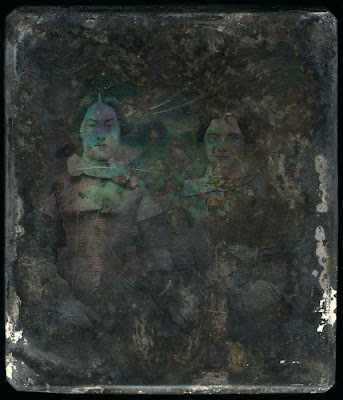 The daguerreotype is an early type of photograph in which the image is exposed directly onto a mirror-polished surface of silver bearing a coating of silver halide particles deposited by iodine vapor. Unlike later photographic processes that supplanted it, the daguerreotype is a direct positive image making process with no "negative" original. Oh wow. There's people who restore these, but that one might be lost. "Ghostly" is the perfect word.